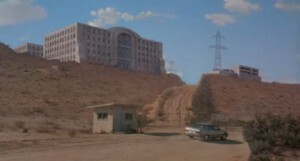 My very first matte painting job was done for Linwood Dunn on a version of Things To Come which starred Jack Palance. If I remember correctly, I did that movie in 1978 or 79. David is correct about my having done matte paintings that used aluminum cutouts as a base, it was for a TV film titled “The Secret War Of Jackie’s Girls” (1980). The director had worked with an Spanish matte painter who used this approach to doing live-on-location matte paintings rather than the traditional glass because this approach shortcut any risk of exposing the reflection of the camera in the scene. I would make a sketch on a sheet of paper that was glued to the aluminum sheet. I then used saws and files to shape the aluminum before painting it. In order to create the sketch in the correct size I needed to calculate the position of the camera relative to the background elements that needed to be changed, calculate the depth of field based on the lens to be used for the shot so that I could figure out where to place the matte painting, and create a scale for the painting from the result of those calculations. To put it mildly, this technique was complicated and no one else in town wanted to deal with it. That’s how I got my start, taking a job no one else wanted. All of the paintings worked well enough. Doing this procedure under the time constraints of a television show was challenging, but it worked quite well. I still have the village painting, which I kept as a souvenir. My favorite was the array of Spitfires that I painted. We had one Spitfire that taxied into the scene in the foreground and the others (painted) looked as though they were parked next to the runway in the midground and distance. We were concerned that the painting would cut off the spinning prop of the real Spitfire, but when we saw the dailies you couldn’t tell at all. Sometimes you get lucky. I actually finished that painting about 10 minutes before we shot as I hadn’t seen the actual location until the morning of the shoot and couldn’t paint the groundplane colors. To make that shot, I created a mockup in my office at Universal by using a survey of Chino airport and a model of a Spitfire which was 1/4 inch to the foot. Using the plane’s scale, I approximated the position of the camera. I placed the model plane on a desk that had been covered with a plan drawing of the airport runway and positioned a still camera on a tripod, raising it so that the center of the lens was about 20 feet (in the same 1/4″ to the foot) above the ground (desktop). Between these I placed a piece of clear cell, upon which I had scratched a grid, to stand in for the position of the painting relative to the camera and the subject. Using that as a guide, I made a full-scale drawing of the squadron, repositioning the model after roughing out each plane. This gave me a line up of planes. I glued the drawing to the aluminum sheet and cut out the planes, then painted them. I needed to rely on my art director to give me the sun’s position for the scheduled time of the shot. When I arrived at Chino airport the following morning, I was delighted to see that the painting blended into the perspective of the location almost perfectly. I then painted in the grass tones. After the shot was completed, I walked back to the car and laid down on the rear seat and went to sleep with my legs hanging out. Someone was kind enough to gently tuck me in and shut the door. I hadn’t slept for 48 hours at that point. My work for “Something Wicked This Way Comes” involved more than matte paintings. The movie had been entirely shot on sound stages with few interiors. When I was assigned to work on a revised version for release, my first job was sketching “inspiration sketches” for a new opening montage of fall exteriors. My sketches were then sent to Ray Bradbury for his use in writing the opening monologue. Based on Ray’s selections, we took a crew to Vermont to scout and shoot locations that matched the subject matter of my sketches as well as locations for the matte painting plates. 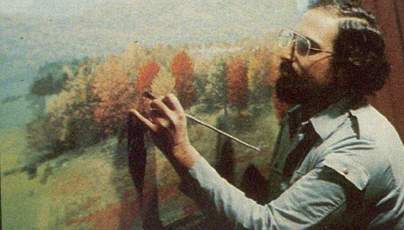 Jessie Silver painting a landscape for the movie “Something Wicked this way comes” 1983. 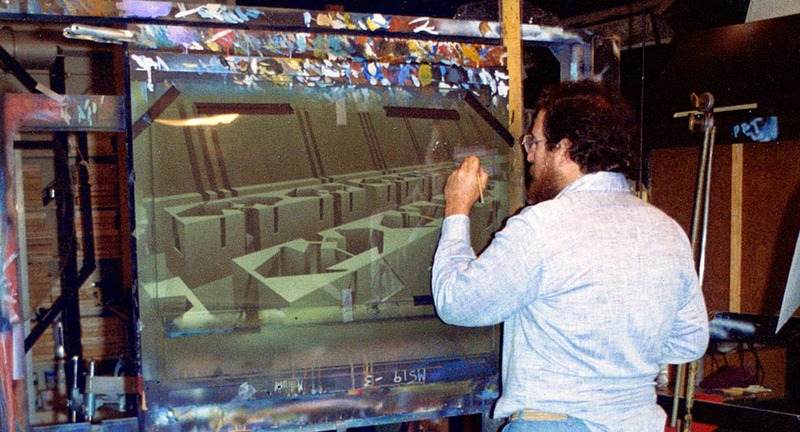 Silver working on a background painting for the film Tron. 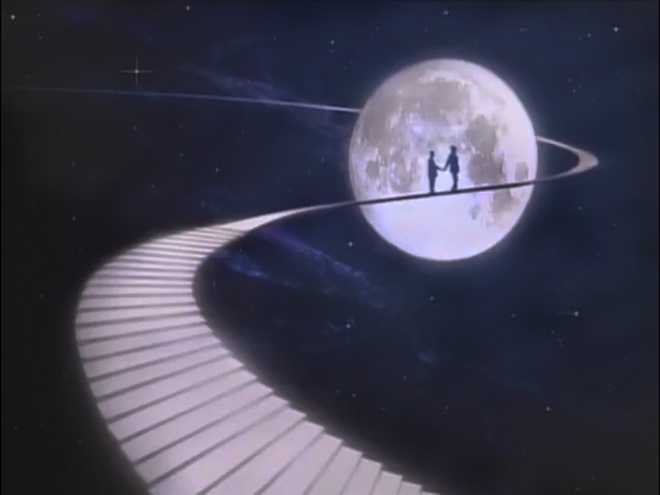 Moonlighting – Everything in the shot, with the exception of the actors and the slope that they’re walking on, is a matte painting. If I recall correctly, they were shot against green screen. - Murder she wrote (1985) TV series. Episode : Sing a song of Murder. 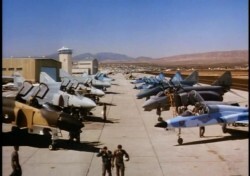 “As I recall, I painted them for Garber Green and they were composited at a small facility in Santa Monica that I think was owned by John Scheele. More Guerilla matte paintings! The set up was pretty rudimentary, which made getting a line up a fairly hit or miss proposition. The prism used to project the plate from the camera onto the masonite or glass was not solidly anchored, which would cause the position of the projected plate to shift.